The success of your next presentation or training course might be thwarted before you begin speaking… wait… what? How? If your audience seating arrangement and overall room setup isn’t aligned with the design of your session, you are starting from a position of weakness. In this article, we describe the core principles that factor into your room setup choices. We then offer an in-depth view of several popular options, and point out the advantages and disadvantages of each. 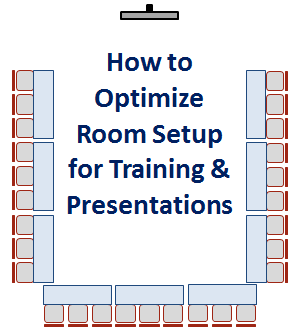 Finally, we end with tips you can use to optimize the room for your audience and set yourself up for success. Before we dig into the many seating styles available, let’s first review the high-level audience-centric principles which will guide your choices. Comfort — Are audience members able to participate fully while facing forward? Or do they need to constantly twist around? Is there enough room for them to get to their seat easily? Will they be bumping into one another constantly? If they are comfortable, they can focus on listening to you. Sight lines — Can audience members see the presenter? The slides? Each other? Clear sight lines allow your audience to absorb the visual component of your message, whether it be slides, body language, or anything else. Utility — Is a surface provided for using a laptop, taking notes, practice exercises, eating, or drinking? You want your audience members to be active learners, so give them space to do it. Proximity — Are audience members relatively close to the screen, the presenter, and each other? Or is it sparse seating? Too far apart drains energy from the room, but too close can be uncomfortable. 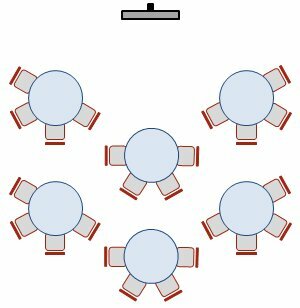 Compatibility — Is the layout of the room and the seating arrangement optimal for the style of presentation/training being offered? Does it support slide content? Large-group discussions? Small-group exercises? These five principles will be our focus as we tour many popular seating styles available for your room. Theater style seating is a series of chairs arranged in parallel rows, all facing forward to the front of the room. No tables are provided. 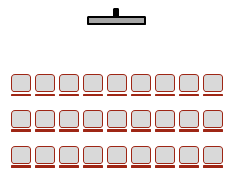 Most large lecture theaters and movie theaters are arranged this way. Allows high-density seating; that is, for a given room size, theater style seating maximizes the potential audience size. Because audience members are close to each other and the speaker, this arrangement tends to maximize the energy in the room. No surface on which to place laptops, writing pads, food, or any other items. Poor sight lines for people sitting near the front corners and, in very large rooms, people sitting toward the back and along the sides. Angle of seats may require some audience members to “twist” their body to face the speaker or screen. May be cumbersome to get to seats, depending on locations of walking aisles. Less overall comfort (i.e. hot, stuffy) due to high density. Audience members have essentially zero eye contact with each other, making discussions inconvenient and unlikely. Presentations for large audiences where the information flow is one-way (from speaker to audience) and there is no requirement for taking notes or using laptops. Classroom style seating is a series of tables (or desks) and chairs arranged in parallel rows, all facing toward the front of the room. Tables (or desks) provide space for laptops, note-taking, and food. Highest density of any seating arrangement involving tables or desks. Poor sight lines for people sitting near the front corners. Angle of seats and tables requires some audience members to twist their body to face the speaker or screen. Training sessions where most audience members are taking notes or using laptops, and where most of the information flows from the speaker to the audience. Boardroom style seating is a single large table (or several smaller tables butting up against one another) surrounded by chairs on both sides. The most common shape is rectangular (as shown in the diagram), but variations include both circular or square tables. Lots of eye contact between audience members promotes discussion. Tables allow for laptops, note-taking, and food. Terrible sight lines to view slides for many audience members, particularly those at the “far end”. Even worse sight lines from audience members to see the presenter, who must either stand to the side (not good) or sit (worse). Multi-tasking (e.g. using a laptop while viewing slides or the presenter) requires lots of body twisting. Depending on length (and shape) of table(s), audience members at the extreme ends can feel isolated. Tables which are circular or square can mitigate this. Small groups focused on discussion and making decisions where there’s no primary presenter and little reliance on slides. U-shaped style seating is a series of tables forming three sides of a square or rectangle, with seating arranged around the outside. 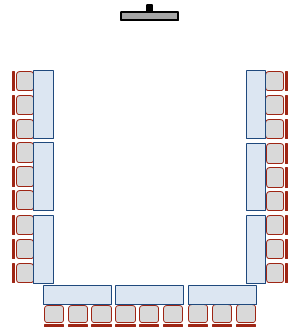 In this arrangement, all seats face the middle of the “U” shape. Clear sight lines (both audience-to-presenter and audience-to-audience) fosters large group discussions. Presenter can walk into open space within the “U”; this creates a unique dynamic because they are “immersed” within the audience. Tends to lead to very low density seating, and thus requires a larger room for the same size audience. Audience members at the “bottom” of the “U” are seated a large distance from screen, leading to several bad results: [a] readability of slides or flip charts is reduced, [b] participants are more easily distracted, and [c] participants are more likely to lose focus. Audience members in the “corners” can feel relatively isolated. Training sessions which are designed to emphasize large group interactions, with less emphasis on slide content. Banquet style seating is when a number of tables are scattered throughout the room, with seating arranged entirely around each table. Tables are often circular, but can be other shapes as well. Tables create focal points which promote small-group discussions. Small group settings create feelings of inclusiveness, and counteract the isolated feeling or anonymity that individual participants may feel within a large group. Many people are naturally facing away from screen, and must turn away from table to see slides or presenter. Tables can promote side chatter among groups unrelated to event goals. Moving to/from seats can be cumbersome, depending on overall room size and walking aisles. Training sessions which are designed to emphasize small-group exercises, with less emphasis on slide content. Cabaret style seating is when a number of tables are scattered throughout the room, with seating arranged only partly around each table. This avoids anyone sitting with their back to the front of the room where the speaker or screen are located. Most people are facing screen and presenter with limited twisting. 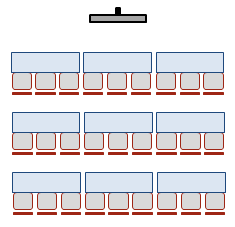 Lower density compared with Banquet style seating. More tables and a larger room are required for the same number of people. Training sessions which are designed to emphasize a balance between small-group exercises and slide content. 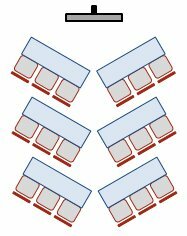 Chevron style seating (or V-shaped seating) is when tables are arranged in a series of angular patterns relative to one another, with seating on one side so that every chair is oriented optimally to face the screen or speaker. In narrow rooms, tables might be arranged in true “V”-shapes (as shown in the diagram); in wider rooms, tables might be arranged with a central “wing” connecting the two ends of the “V”, like this: \_/ . Everyone faces the screen and presenter, so nobody has to twist their chair. Note-taking or using a laptop is thus comfortable for everyone. Many audience members are now able to make full or partial eye contact with each other, promoting group discussion. Relatively high density (similar to Classroom seating). Individual tables support small-group exercises. While some large group discussion is supported, it isn’t ideal because some people are still looking at the backs of other people’s heads. Training sessions which are designed to emphasize slide content, but also want to incorporate some small-group exercises and some large-group discussion. 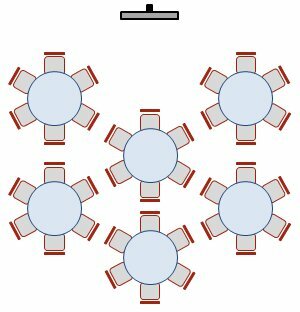 What is the Best Seating Arrangement? It depends! There’s no single seating arrangement that works best for all speakers and all settings. I have had productive sessions (both as the speaker and as an audience member) in all of the above arrangements, and I’ve also been in many rooms which were not set up properly to support the goals of the session. A trainer who trained me several times usually adopts U-shaped style seating, because her courses rely heavily on large-group discussion, and she feels very comfortable sitting in the middle of the “U”. On the other hand, I generally prefer chevron style seating for the courses that I teach, because I feel it offers the best blend of comfort and flexibility to support the slide content, large-group discussions, and small-group exercises which I design into my courses. Regardless of the seating arrangement that you choose for your event, be thoughtful and action-oriented when it comes to setting up your room for success. Every style above can be modified and enhanced to further support your goals. Be proactive. Plan for success. The overall success of the presentation or training session reflects on you. Ask questions about what is possible. Think about the seating arrangement that will best support your format, and make it happen. Show up early and roll up your sleeves. If the room isn’t set up as you requested (and if the furniture isn’t all bolted to the floor), then go ahead and move it. Several times, I’ve asked for chevron-style seating with tables, and discovered that the tables were stacked at the back of the room. Moving them was a small effort to invest in the success of the training session. When your audience is unnecessarily far away from you, it’s harder for them to hear you, harder for them to read your slides, and harder for you to connect with them. I have routinely moved all of the seats forward to improve this situation. Suppose you know that your audience is going to be 30 people, but the room is set up with 6 rows of 10 chairs each (=60 seats total). Most people tend to choose a seat toward the back. The result is that most of your audience will sit in the back half of the room. This reduces the overall energy in the group, and makes it harder for them to hear you and see you (and your slides). You have several options: [a] push the chairs/tables all the way back so they aren’t an option, [b] tip the chairs on the back rows forward to indicate they are blocked, or [c] “tape” them off. Identify and solve sight line problems. Check the seats in the corners to make sure that someone sitting there can see [a] the screen, [b] you (even as you move around) and [c] any other equipment you’ll be using (e.g. flip charts, white boards, etc.). I recently delivered a training session in a long, narrow room which could only be set up in Boardroom style. The consequence was that most participants would not be able to see both the screen and the flip chart if I left them side by side. So, I decided to pull the flip chart to a central location when I needed it, and then push it away again to support focusing on slides. Plan your movement with room constraints in mind. Remember that your body will block sight lines too. Map out where you can stand to avoid blocking your audience’s view of the screen, whiteboard, or flip chart. Design your slides with room constraints in mind. If you know that the room will be set up in such a way that everyone past the front row can’t see the bottom 10% of your slides (which is the case in many rooms), then don’t place any useful information there. Which seating arrangements do you prefer? As a speaker or trainer, which seating style helps you achieve your goals? As an audience member, which seating style is most conducive to your goals? Have you ever been in a room which was set up in a way that contradicted the goals of the session? It always amazes me how many presenters just accept the room as it is when they walk in. Thanks, Simon. Good to hear that others are being proactive with the room setup too.